It might officially be Fall on the calendar, but so far the weather around here hasn't noticed! Although, it's not as bad as it was a few weeks ago (over 100*) but it’s not quite sweater weather yet. 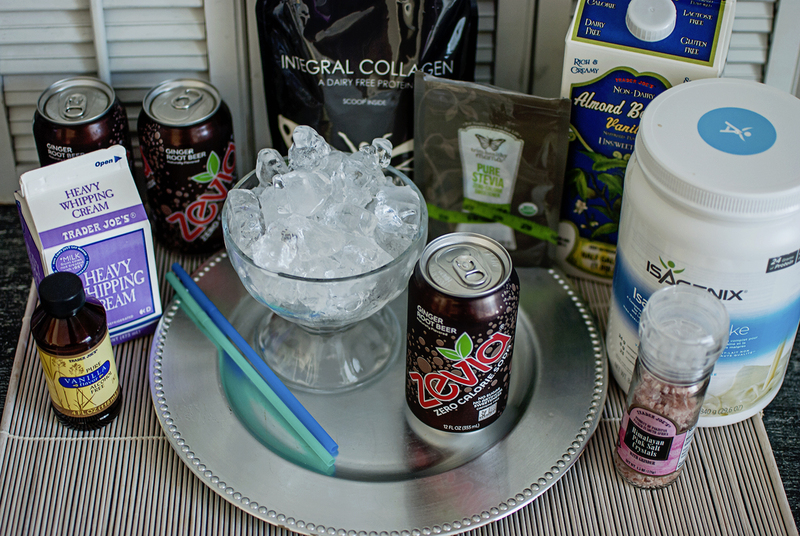 To stay cool, I've been making quite a few Sugar Free Low Carb Root Beer Floats. Something frosty to drink that is nice and icy and won't kill my diet? Root Beer Floats for everyone! As I've mentioned before, I'm trying to stick with the Trim Healthy Mama eating plan. 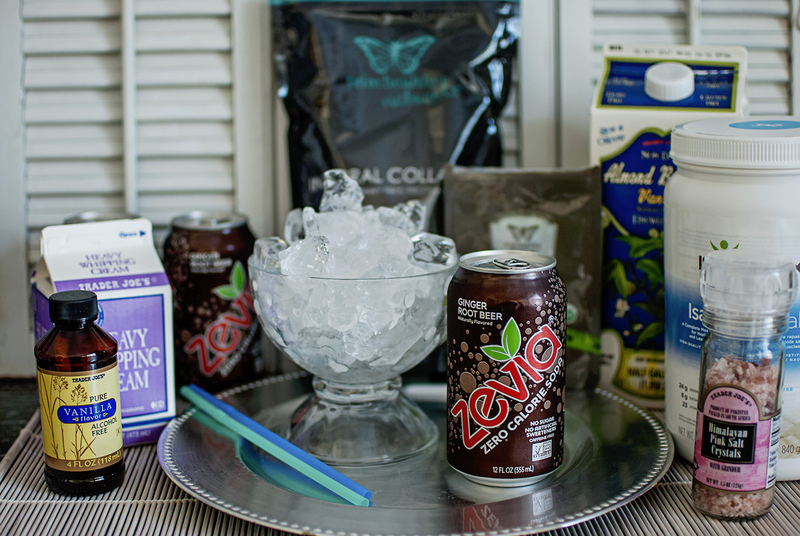 I discovered this sugar free soda by Zevia a couple of years ago, and it quickly became a favorite. It is sweetened with stevia, and if you're not used to the stevia taste, it might take a little getting used to. I love it though! I wanted a root beer float recipe that didn't use ice cream. 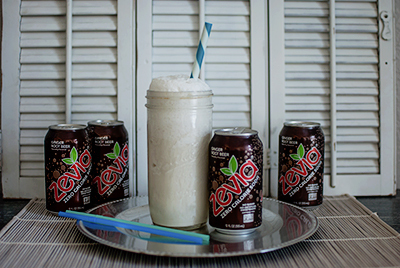 There are sugar free brands out there, but I had a hard time finding them at my local grocery stores, which ironically do happen to carry Zevia brand soda. 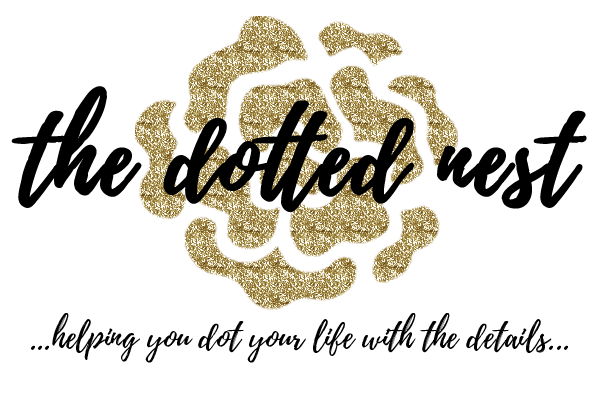 So I figured out a way to make my own! It’s a little more “slushie” instead of “ice cream”, but the taste is perfect – just like a root beer float! This is such an easy drink to make! You will need a blender - I very much recommend the Ninja blenders. I have this one, and use it almost every day. I love that it comes with the "stick" cup for smaller recipes. Use a blender or a stick blender to combine the Ice, Almond Milk, Heavy Cream (or alternative dairy free cream, or just omit), Vanilla, Pink Sea Salt, Stevia, Protein Powder, and Collagen. You want it to be a slushie like consistency. Pour the Root Beer over your ice mixture, and watch the root beer do it’s magic! 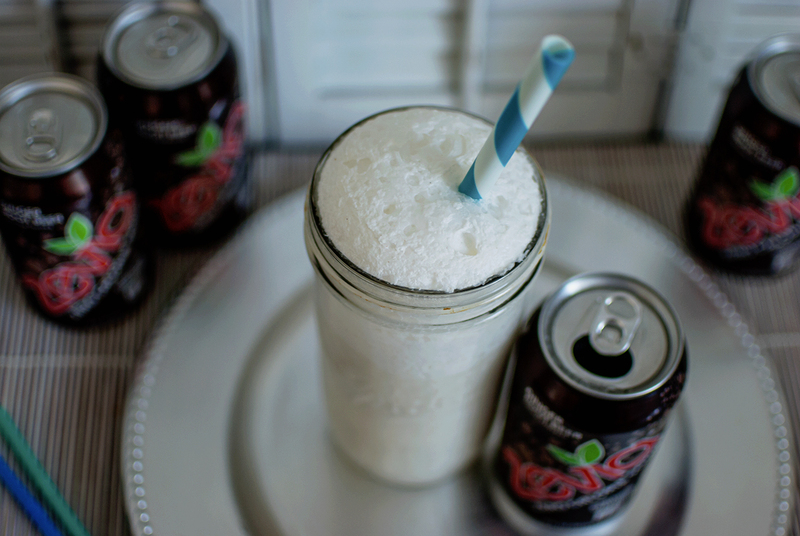 And there you have it – a yummy delicious Sugar Free Low Carb Root Beer Float. *Please note: If you are following THM, this would be considered an "S", so make sure to keep it in the S mode. You can also make it an FP if you omit the Heavy Cream! I thought I'd also make a quick note and tell you that this post was not sponsored by Zevia...but it IS a product I use and love!